Nicotine and Other Tobacco Compounds in Neurodegenerative and Psychiatric Diseases: Epidemiological Data on Smoking and Preclinical and Clinical Data on Nicotine provides a comprehensive summary of the epidemiological data on smoking and several neurological disorders, including Alzheimer’s disease, Parkinson’s disease, Multiple Sclerosis, Tourette’s syndrome, schizophrenia, anxiety, depression and ADHD, as well as preclinical and clinical data on the effects of nicotine. Despite the obvious and undisputed harmful nature of smoking, evidence suggests that some tobacco and tobacco smoke-derived constituents may offer neuroprotective effects, possibly in combinations, rather than individually. 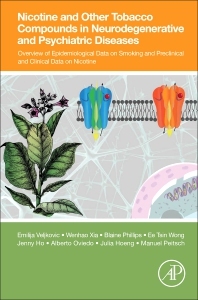 This unprecedented book describes the complex relationships between smoking and neurological disease and the bioactive compounds found in tobacco. It provides a comprehensive review of nicotine and other compounds found in tobacco plant, with scientific evidence of neuroprotective and anti-inflammatory effects that may act in conjunction with nicotine to exert neuroprotective effects observed in smokers. By presenting findings beyond harmful cigarette smoke effects, attention can be drawn to individual compounds of tobacco that may serve as inspiration for further therapy development. Dr. Veljkovic is Manager - Study Management at Phillip Morris International in Neuchatel, Switzerland. Her research group is responsible for in vivo studies designed to further characterize the exact role of the cigarette smoke in initiation and development of lung pathologies (lung cancer, COPD) and CVD. She has nine years of experience in the tobacco industry, with a focus on inhalation toxicology and modeling of smoking-related diseases (lung cancer, chronic obstructive pulmonary disease) engaging systems toxicology approaches. With a thorough understanding of nicotine-related toxicity in animal models, Dr. Veljkovic and her team have prepared a number of internal strategic documents that required an extensive literature review about effects of nicotine and non-nicotine tobacco constituents in different diseases including neurological and neurodegenerative diseases. She holds BSc, MSc and PhD degrees in molecular biology and physiology. Dr. Xia is Scientist - Study Management at Phillip Morris International Laboratories with experience in drug discovery for neurodegenerative diseases. He has a profound understanding of molecular mechanisms of neurodegeneration in preclinical in vivo models and holds a BSc in life sciences and a PhD in neurobiology. Dr. Phillips is Senior Scientist - Study Management at Phillip Morris International in Singapore. His research group is focused on late-stage biological assessment of next generation reduced-harm tobacco products within the framework of the R&D department. He is an expert in inhalation toxicology and modeling of smoking-related diseases using systems toxicology approaches. He has ten years’ experience in biotechnology and the pharmaceutical industry, and a thorough understanding of nicotine-related toxicity in animal models. Dr. Phillips holds a BSc in molecular biology and a PhD in medical science. Dr. Wong is Senior Scientist - Study Management and has 4 years of experience in tobacco industry, focused on OECD type of toxicology studies and modeling of smoking related diseases, especially lung cancer. Ee Tsin has a solid understanding of nicotine toxicity in rat and mice in inhalation set up. Ee Tsin holds BSc in biochemistry and PhD in biology. Dr. Ho is Scientist - Study Management with expertise in bioanalytical method and a focus on detection and quantification of smoke exposure markers. Her specialities include development and validation of analytical methods for biopharmaceuticals and chemical entities, protein sequencing, nano- and bio-material production for bioapplications, and vaccine and drug delivery systems. Dr. Ho holds a BSc in chemical engineering and a PhD in biochemical engineering. Dr. Oviedo Casado is Supervisor - Bioscience Operations, with a focus on inhalation toxicology and modeling of smoking- and inflammation-related diseases. His group is responsible for the execution of pre-clinical studies, and he manages the scientific technique portfolio. He has an extensive understanding of nicotine and tobacco products toxicity in the context of OECD type of toxicological studies. Dr. Oviedo Casado holds a BSc in biochemistry and a PhD in cell and molecular biology. Dr. Hoeng is Director of Systems Biology at Phillip Morris International and program leader. She has a profound understanding of inhalation toxicology and computational modeling of smoking-related diseases, lung cancer, COPD, and CVD. Dr. Hoeng holds a BSc in biology, MSc in bioinformatics, PhD in protein crystallography, and an executive MBA. Dr. Peitsch is Chief Scientific Officer and VP of Research and Development at Philip Morris International. He has extensive experience in tobacco harm reduction, smoking-related diseases, systems biology, toxicology, bioinformatics, chemoinformatics, high-performance computing, and knowledge management. An innovation-focused results-driven biomedical research leader, Dr. Peitsch has many years of experience managing large multi-cultural teams across several countries. He holds several patents related to proteomics, genomics, and computer science and has published over 200 book chapters, technical reports, and articles in top ranking scientific journals (cited over 22000 times). He has done pioneering work in the area of molecular modeling, cell biology, computational text analytics, and systems biology/toxicology and is a founder of several initiatives, including two start-up companies, the Swiss Institute of Bioinformatics, and the [BC]2 conference (http://www.bc2.ch). He is Chairman of the Executive Board of the Swiss Institute of Bioinformatics and an active scientific advisor to several academic and commercial entities. He has also served on the Swiss National Research Council. Dr. Peitsch is a Computerworld Honors Laureate and a recipient of several awards including the New England Business and Technology Award and the United Devices Grid Visionary Award. He holds a BSc in life sciences, MSc in physical chemistry, and PhD in biochemistry. He is also Professor of Bioinformatics at the University of Basel.